The Tipsy Baker: I need my ruby slippers! Jaipur, the pink city, was a bit damp. We're back in Delhi waiting for our flight home. . . in 28 hours. I would start walking right now, barefoot, if it would speed our return. Tomorrow we're going to see more of Delhi, but I really just want to eat some butter chicken at Karim's and get on that midnight plane. I'm going to buckle the seatbelt, open a tiny bottle of Delta's finest red, toast the accomplishment of a lifelong goal, put on the headphones, and fall into a stupor watching Prometheus. Do I make it sound like we haven't had fun in India? We've had lots of fun. But I didn't expect to relax and haven't. I feel braced for disaster even when sleeping. I'm a hyper-vigilant Western princess! Between terrifying road conditions (camels, tractors, speeding trucks, overturned buses, sleeping cows, naked toddlers), ignoring sad beggar children, avoiding belligerent cows, avoiding noisome bathrooms, remembering to take the malaria pills, scrutinizing every morsel that goes in Owen's mouth, wondering if a cap-sleeve dress is modest enough for rural Rajasthan . . . 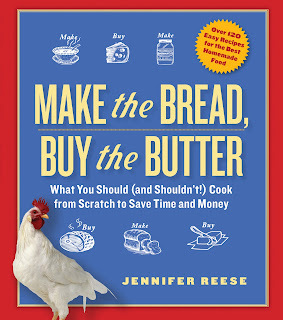 It's a lot harder than pricing peaches at Whole Foods. From a buffalo? Cow? Goat? Definitely unchilled. -People make the yogurt, buy the paneer. Or so said our Jaipur guide. If I ever come back to India, I need better culinary sources. -Diet is tightly linked to caste. Very low caste Hindus eat the pigs that you see rooting around in the garbage. Brahmins aren't supposed to eat meat at all. When you order "mutton" at a restaurant you are probably eating goat. We ate "mutton" on one occasion and it was delicious. I am truly sorry, Natalie. 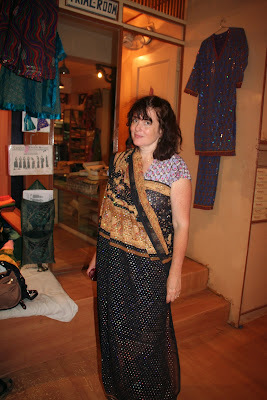 -After I swore off shopping in India altogether, we ended up in one last textile shop. Walking toward the front door, I steeled myself for the onslaught of the salesmen. I told Kumar, no thanks, I absolutely didn't want to try on a sari. And it was the ugliest sari there. But suddenly I was wearing a sari. I also said no to the block-print tablecloth, but somehow it is now in our suitcase. I still like that kid. -Gunpowder chutney. I mixed it with ghee and drizzled it on masala dosa this morning and am definitely making this fabulous condiment when I get home. Ditto lemon pickle. -The Taj Mahal. So perfect, I almost cried. I wrote a report on this in 4th grade. No, this trip has been fantastic. Well, riding a roller coaster can be fantastic, but doing it for days on end would be tiring! Being hyper-vigilant is exhausting. I'm glad you had fun, can't wait for the report. Is lemon pickle different from lime pickle? I am very impressed. I don't think I could hack India, I have trouble enough traveling in Anglocentric countries. you are giving Owen great gifts with these amazing trips. Dang, I forget to check your blog for what feels like only a couple of days and you've been and gone to India! It sounds like a marvelous experience. Jennifer! So good to hear a bit about your trip. Can't wait to hear more soon. Here's to a smooth journey back home! congrats on completing your trip and your dream. owen looks wonderful. i am eager to see those textiles/rugs etc. textiles are such super "souvenirs". i hope you can sleep for 3 days when you get home. I have always wanted to go to India, but I understand the weariness at the end of a long trip - especially when you have to be so constantly vigilant. In college I went on a geology field trip to Greece and Turkey (it was paid for by a very generous alumni donor). Hard to believe, but after three weeks I began to tire of feta. In Turkey we had to avoid anything that might have touched the water and I was perfect until the last night when unbeknownst to me a waiter put some ice (which melted before I saw it) in our bottled water. I was rather ill on the plane ride home. When I recovered the first thing I ate was a grilled cheese sandwich and a chocolate milkshake. It was one of the best things I have ever eaten in my life!